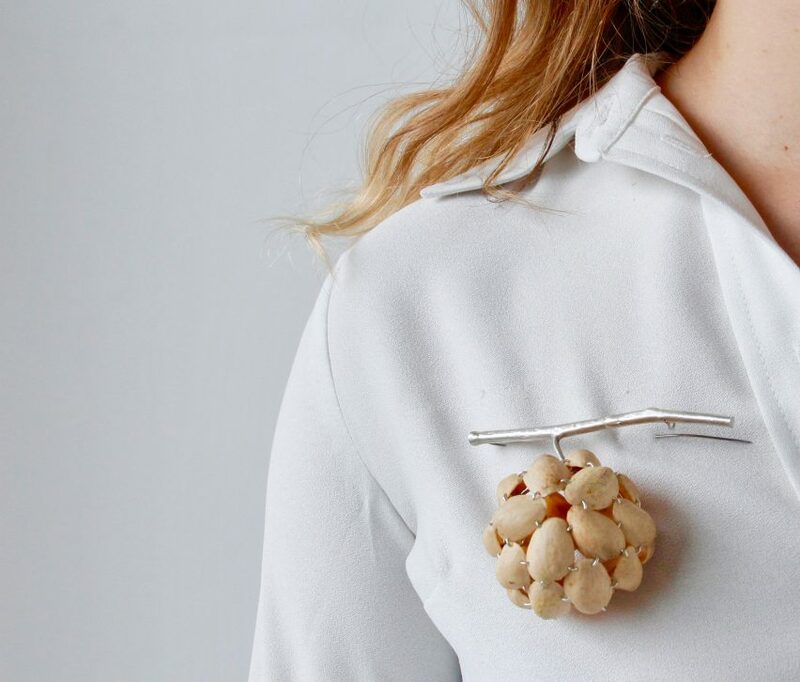 Central Saint Martins graduate Belle Smith combines discarded pistachio shells with precious metals to create her jewellery pieces. London-based Smith creates a wearable textile with the repurposed waste shells, by attaching them to delicate necklace chains made from recycled silver and steel. She then shapes this textile into hollow spheres and tubes. Before being threaded onto the wire chains, each shell is measured to ensure a snug fit. As a result, these otherwise fragile elements form a single sturdy structure, not dissimilar to chainmail. 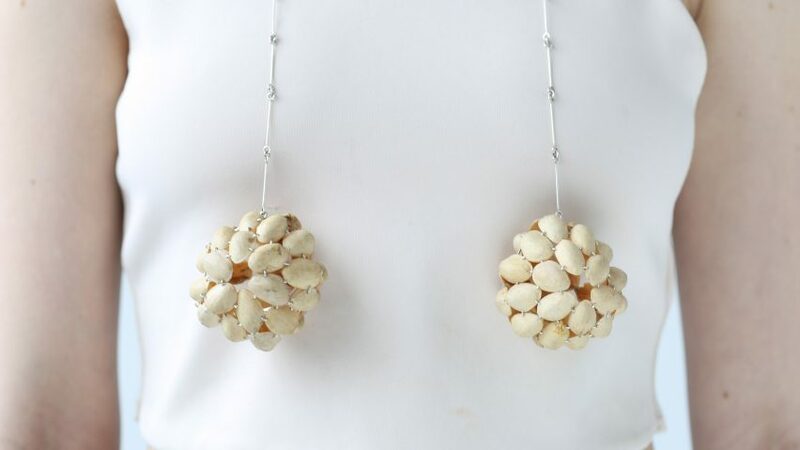 According to the designer, the pieces were inspired by the “protective role” of the shells in relation to the nuts inside. Comparing them to a womb protecting ovaries, Smith describes the shells as “nature’s vessels of fertility”. “The purpose of my collection is to accentuate the sensitive vessels that are our bodies, its delicate forms and curves, highlighting our precious role of growth and fertility as humans,” she said. “This will be mirrored in the pistachio vessels my pieces will obtain, as pistachio shells have a purpose to protect and nurture their seed just like women do,” she added. Smith looked to Japanese crafts techniques when producing the jewellery, experimenting with different processes that celebrate flaws. One of her influences was the Japanese concept of Wabi-Sabi, which regards imperfections such as asymmetry and roughness as beautiful, and focuses on the integrity of natural objects and processes. “This pushes me to test and explore a material in depth, and not be too worried about the outcome,” said the designer. Some of the designs work with the shape of the pistachio, for instance, one shows the nut growing on a tree branch. 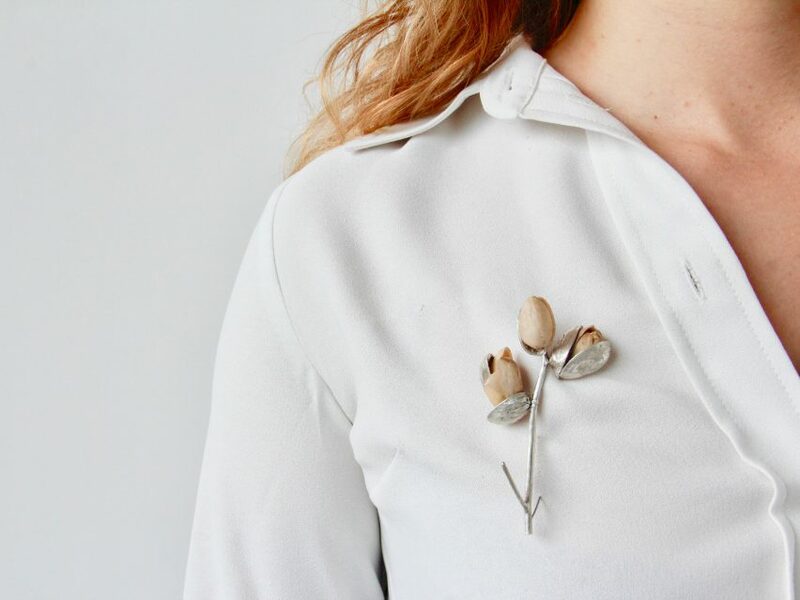 To achieve this, Smith used recycled metals to create brooches in the shape of twigs, with real pistachio shells fused to their metal counterparts. The designer believes the collection will bring wearers closer to nature. But she also hopes to promote circular economies, by demonstrating how they already exist in nature – in the way plants grow, die and regenerate. Other graduates have also looked to natural materials when designing jewellery. Design Academy Eindhoven graduate Lucie Majerus used her own extracted wisdom teeth to make her jewellery, as an alternative to materials harvested from other animals, such as elephants.